Pressure adjustment is easy with the handle-type adjustment screw. 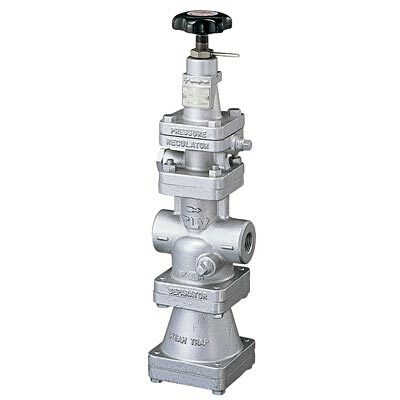 Even if the steam flow (load) to the equipment or the primary pressure at the pressure reducing valve changes, the Shock-absorbing Spherical piston (SAS) supplies stabilizes the steam pressure in order to stabilize the temperature of the steam used as the heating source. Condensate entrained inside the steam piping is removed, enabling the supply of very dry steam. Product features a built-in Cyclone Separator with a 98% condensate separation efficiency. The separator improves the dryness of the steam and removes scale entrained in the steam. The condensate that is separated out is quickly removed through the built-in Free Float® steam trap. The quality of the steam itself is improved, and this results in an improvement in the heat conductivity of the steam. This product is ideal for compact processes. It is particularly recommended for processes such as atomizers, in which steam comes into direct contact with the product. 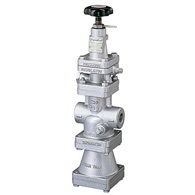 Presses, heat exchangers, jacketed kettles, steamers, etc.